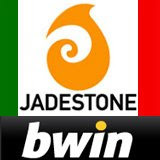 Jadestone Networks, the Nordic based online games owner and operator, today announced that its GamArena skill games – available through bwin Italy – are the first cash skill games to be legally offered in the Italian market. Players can test their skills in a variety of games and in tournaments ranging from Yatzy to Scarab Solitaire. So far, Black Jack has been the clear favorite among Italian gamers. All in all, the reception by Italian players has been very encouraging with daily rakes well ahead of Jadestone Networks’ initial projections.